Add white rum, lime juice, simple syrup, strawberries, and basil to a blender. Blend until smooth, approx. 1 min. Add crushed ice and blend once more, approx. 30 seconds. 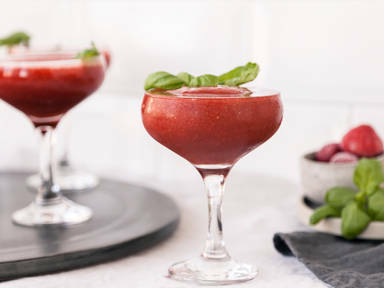 Pour daiquiri into coupé glasses, garnish with basil, and enjoy!